With applications ranging from medical diagnostics to environmental monitoring, molecular sensors (also known as biosensors, chemical sensors, or chemosensors), along with emerging nanotechnologies offer not only valuable tools but also unlimited possibilities for engineers and scientists to explore the world. New generation of functional microsystems can be designed to provide a variety of small scale sensing, imaging and manipulation techniques to the fundamental building blocks of materials. 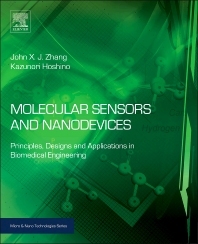 This book provides comprehensive coverage of the current and emerging technologies of molecular sensing, explaining the principles of molecular sensor design and assessing the sensor types currently available. Having explained the basic sensor structures and sensing principles, the authors proceed to explain the role of nano/micro fabrication techniques in molecular sensors, including MEMS, BioMEMS, MicroTAS among others. The miniaturization of versatile molecular sensors opens up a new design paradigm and a range of novel biotechnologies, which is illustrated through case studies of groundbreaking applications in the life sciences and elsewhere. As well as the techniques and devices themselves, the authors also cover the critical issues of implantability, biocompatibility and the regulatory framework. The book is aimed at a broad audience of engineering professionals, life scientists and students working in the multidisciplinary area of biomedical engineering. It explains essential principles of electrical, chemical, optical and mechanical engineering as well as biomedical science, intended for readers with a variety of scientific backgrounds. In addition, it will be valuable for medical professionals and researchers. An online tutorial developed by the authors provides learning reinforcement for students and professionals alike. Xiaojing(John) Zhang is an Associate Professor in the Department of Biomedical Engineering at the University of Texas of Austin (UT Austin). He received his Ph.D. from Stanford University, California, and was a Research Scientist at Massachusetts Institute of Technology (MIT) before joining the faculty at UT Austin. Dr. Zhang’s research focuses on integrating Micro-electro-mechanical Systems (MEMS), nano-materials, micro-imaging and biosensors to provide innovative solutions to critical healthcare issues. Dr. Zhang has actively engaged in teaching new concepts and methods in these emerging biomedical engineering frontiers and has demonstrated innovation and excellence in engineering education. The materials presented in this textbook are based on his lecture notes while teaching a popular course on molecular sensors and nanodevices at UT Austin for the past 8 years. He has a track record for developing both core and emerging engineering curriculum along with developing well-funded research programs with fellow students. Among his numerous awards, Dr. Zhang received the Wallace H. Coulter Foundation Early Career Award in Biomedical Engineering, NSF CAREER award, DARPA Young Faculty Award among many others. To recognize his accomplishment in research and education, Dr. Zhang was selected to attend the prestigious US National Academy of Engineering, Frontiers of Engineering (NAE FOE) program in 2011, the NAE Frontiers of Engineering Education (NAE FOEE) program in 2012, and subsequently China-America Frontiers of Engineering Symposium (CAFOE) program in 2013. As an active member in his professional community, Dr. Zhang has served on numerous international conference organizing committees and editorial boards. He is an editor for ASME/IEEE Journal of Microelectromechanical Systems (JMEMS) and an associate editor Biomedical Microdevices. Kazunori Hoshino received his PhD degree in mechanical engineering from the University of Tokyo, Tokyo, Japan, in 2000. He worked for the University of Tokyo from 2003 to 2006 as a lecturer in the Department of Mechano-Informatics, School of Information Science and Technology, where he conducted several government funded project as the principal investigator. In 2006, he joined the University of Texas at Austin, where he works as a Senior Research Associate in the Department of Biomedical Engineering. His research interests are (1) NEMS/MEMS-based nanophotonic sensing and imaging systems and (2) microfluidic detection, imaging, and analysis of cancer cells. He has more than 100 peer reviewed publications in top international journals and conferences in the field of sensors, micro-electro-mechanical system (MEMS), and micro total analytical systems (µTAS). He is the inventor of 6 issued US patents and 12 issued Japanese patents. The courses he has taught at the University of Tokyo and the University of Texas at Austin include: molecular sensors and nanodevices, intelligent micro-electro-mechanical systems, digital control systems, and engineering mathematics.